Well, the JA isn't as active as it used to be, but some people have remained active on the servers through the years. And some of us decided a while ago that the JA would benefit from classes being 'out there' so that, in the event people would sign up and join us to learn, we *actually* have something to offer them. Both Jaina and me came out of retirement and are JATs now. Her padawan, Zachry, got trialled for JAK and passed a while ago. So we effectively have 3 server-active JAK+. Also, I can't ignore the efforts some other members have made on the US side of things. (E.g. Cloud, DJSilva.) They rented some unofficial U.S. servers and advertised this place to increase activity. New people have signed up and are learning in the JA as we speak. To help matters, Jaina has gotten rid of the server password, making it publicly accessible, so that people can find us and play with us instantly. Don't expect any miracles, however. We're not in the shape we used to be in 2004/2005 of course nor do we have 10 people on our server every day. There's simply a small group of maybe 5-10 people who play sometimes. But... the JA is again doing what it's designed to be doing and that is teach people to become better players. This comment was edited by Dash Starlight on Aug 30 2014 09:33am. I'm glad I wasn't in Hufflepuff! I think Slytherin suits me the most of all of them. Ravenclaw isn't bad, but it isn't me. YOUR LOCKED IN HERE WITH ME! 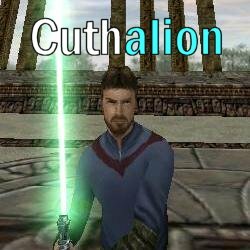 Hey Cuth, how's it going? I don't know what's been happening with "the powers that be" for the last several months, but if your ideas had merit, then it's also likely that it's going to be hard for them to happen considering the state of the game and the JA as a whole ie. it's hard to convince someone to dedicate 99% of their free time to TJA considering the state of things, and that would be the case whoever was a staff member and indeed has been however much people have been promoted. For example, I'm always happy to consider any idea based on its merit and help with it, but I just can't give that much time or attention to the academy and it's been hard to for the last several years. Good. Can't say I've seen you around the servers though. But I understand, everyone has to let go at some point. OMG Cuth? I haven't seen you since I signed up! Wakey wakey! Same here, I just moved to another compy so it made it harder to get on here. LOL. Now I just gotta reinstall my CD copies. Yes, but only on the demo and when I get on it the second time it sent me back to the first level all over again. (There's only two, but still...) I'll have to get back on it again to see if it makes me start over. My character is saved though. I read up alot on the Star Wars characters,so if you want to know more about one of them I'm the fan to talk to. Kit Fisto and General Grievous are also my favorite characters of them all. May the force forever be with you. The first change was from Romaji letters into Katakana. Today I changed it to Hiragana. Both of them are Japanese fonts and they are based on the sound of the syllables instead of letters. Proud owner of Buster Senatu's 200th & 300th, Muro's 370th, Maher's 2100th, Henkes' 1639th, Johauna's 400th, 666th and 900th, Sho Koon's 2000th and Kain Sol's 600th comment Download Laziana's lightsaber here! Glory to Arstozka! I started at about 5pm GMT+1 and an hour later we were with 5 people. This comment was edited by Dark D'Kana on Feb 20 2011 12:10am. Favourite JA Moment: Joining the Academy, becoming Virtue's padawan and passing my JAK trials. What the JA Means to you: A place that I have good memories of. Anything else you'd like to add? I've had good times here in the Jedi Academy. Thanks to everyone who has made it special for me! There ya go, Cuth The yearbook looks really good tbh, this is a great idea to bring back! While being an article writer for the best part of a year, you wrote one article, and a post that looked more like a request for other people to do stuff. Don't worry, I'll be back on IRC soon. well, there are no new JAKs or so while you have been away. The active users are the usual bunch, from the top of my head: Jaina, Dash, Xanatos, Lok, Dark and so on. Others pop up once in a while, but yeah - that's that. nothing too fancy going on at the moment, actually the activity is picking up a bit, it was pretty bad over the last couple of month like october till mid-january or so. i am doing pretty good, thx for asking. how about yourself? hope to see you around the servers soon, maybe?